The idea of a quick tutorial using a multiplayer battle, including two races that I have never seriously studied or used, did not quite work out as expected. Although it was fun, the two rounds that I published took me the best part of three hours to produce, so this may turn out to be another marathon along the lines of my ongoing battle between the Coral Elves and Firewalkers. 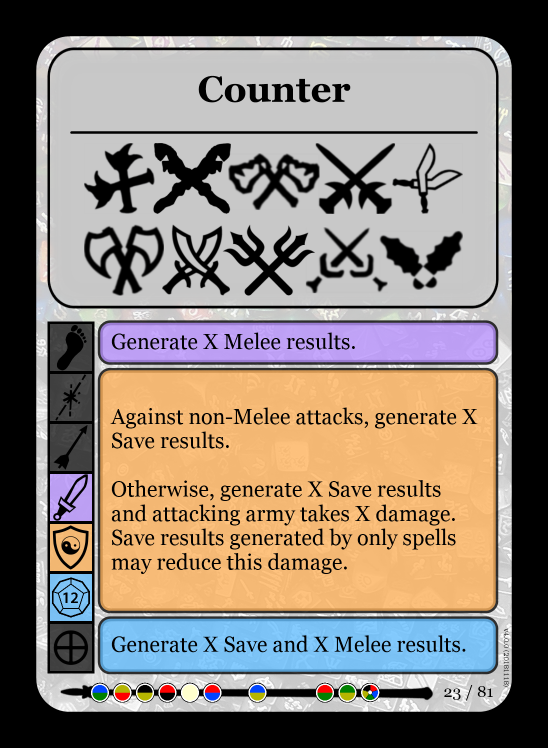 I will try to keep this at ‘beginner level’ in that the tutorial will be about the basic game mechanics but, as happened yesterday, I may be tempted or even forced onto explaining some of my moves at a tactical level. If any of my decisions, therefore, could or should be better explained, please comment this post and I will endeavour to cover them in more depth. I have included a shot of the whole table for the blog followers who are furniture aficionados. We start at the third round with the Undead. At the start of the round, the Open Grave spell on the Scalders’ home base expires. There are no spells currently active at any terrain. The Undead campaign army, confronting the Swamp Stalkers at the frontier are slow, and the terrain is on its 6th face. They therefore look for help by using minor terrain. A deadland bridge. A stroke of luck gives them double IDs when rolling to manoeuvre. This, plus the fact that it gives them a taste of their Bone Magic ability, may come in useful to hold back the Swamp Stalker army. Being Undead, and not worrying too much about the Stalkers’ ability to Mutate, the attack with melee. They produce a very respectable 11 melee results. The Swamp Stalkers try to save. They generate only 3 results and take 8 damage. 5 units are sent to the DUA. This means that they are now able to Mutate, at the start of their turn after the dragon phase, whenever an opposing army is in reserves. This might be fun to watch. The undead see the large contingent of magicians making up the Scalders’ home army and, despite have no missile attack of their own, they try to manoeuvre to the 4th face, taking away the possibility of casting magic from them. The fleet-footed Undead outmanoeuvre the Scalders 5 – 2 and the terrain goes to its 4th face showing missile distance. Pretty much useless to both combatants. They pick up a few rocks and sticks in a vague hope of causing a bit of missile damage, however. An apparition connects with a boulder. But the shield turns out to be mightier than the rock. 3 save results mean that the Scalders take no damage. The Undead appear to be well in control at two terrains, and do not need to use the reserves at this time. The Scalder forces are split into two factions. The home army, largely magicians, facing an usually nimble bunch of Undead creatures, and a horde containing cavalry and infantry units at an otherwise deserted Undead home terrain. The unopposed horde march to the 5th face, giving missile range. In the distance they see a small army of Swamp Stalkers. Given that these creatures can already use Mutate, there is no longer reason not to use them as target practice. The counter SAI does nothing during missile attack, so the resulting missile results are limited to 2. As The feyland is Watery, the racial ability ‘Born of the Swamp‘ comes into play with the Swamp Stalkers, the 3 generated manoeuvre results all counting as saves. This means that they take no damage. The Scalders home army are in need of being able to use magic and are impeded by their home terrain having been moved to missile range. They either try to manoeuvre or they bring in a minor terrain in the hope of getting a useful result from this. A feyland bridge is chosen. 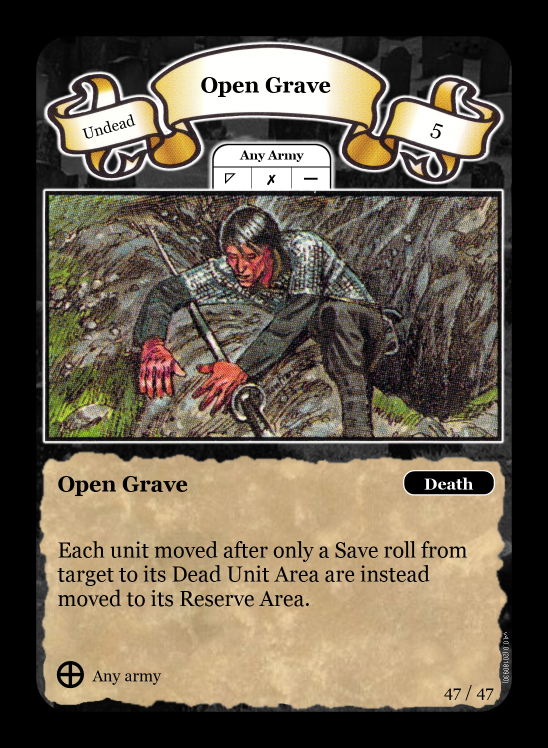 No magic, but they get manoeuvre assistance if the undead try to close in further next round. They attempt to attack the opposing undead with missiles. It was enough to show them where the undead strength lies – melee, but not quite enough to cause damage. The magic units make their move to the reserves, where they will be more useful. Leaving a few troops behind to hold back the undead. Before the first march, the Swamp Stalkers use their Mutate Racial ability. At least 1 Swamp Stalker in the DUA – Tick. Two units are chosen and rolled. No saves generated, so both are killed. The two units are worth 4 health, So Swamp Stalkers can recruit or promote 4 health worth. The Bog Adept is promoted (1 health), a Ravager is recruited (2 health) and a Warmonger is recruited (1 health). Total 4 health points extra in the Swamp Stalker campaign army. It now looks a bit healthier. The Swamp Stalker campaign army try to manoeuvre. They lose by 2 – 4 (undead ID is doubled due to the minor terrain on double manoeuvres), so the terrain remains on its 6th face. They do not carry out any further action, needing reinforcements. A Striker joins them from the reserves. Please click on the 2 in the circle below to continue.